In order to supply a household with the basic infrastructural needs, we tend to use centralised networks for power, water, waste and waste water. This centralised approach is more suitable in densely populated areas that are characterised by short distances from input to output or output to input. The Eco Lodge project plot is far away from these kind of supply networks. 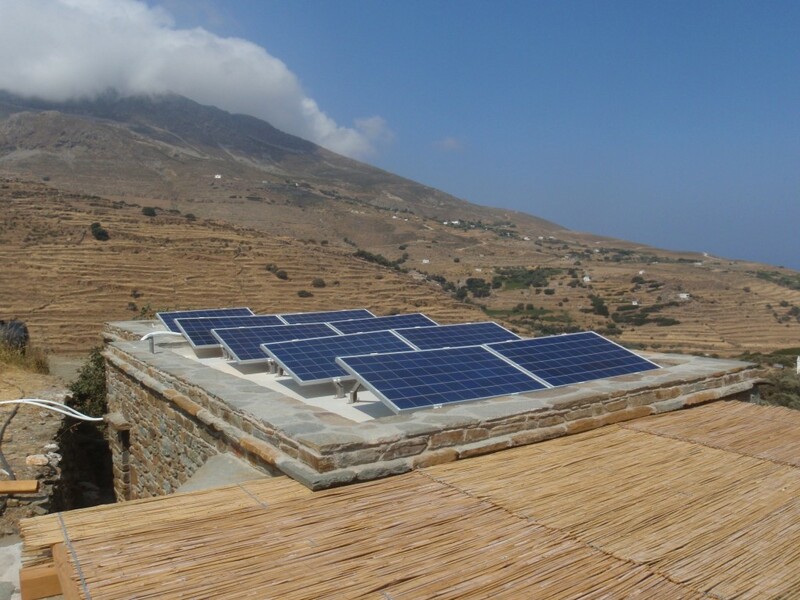 That’s why off-grid solutions became very attractive, on the one hand because we believe that under circumstances like these, they can do a better, cleaner, cheaper and more sustainable job and because necessary due to the location. All these different elements come together to form a highly sustainable infrastructure for modern living. We had to consider whether we wanted access to the power grid or if we wanted to try to design an autonomous system powered by photovoltaic and wind generators. The first choice would have meant paying the DEH (Greek Power Company) to lay overland cables from the nearby village as far as the plot. Considering the cost and the effect on the landscape (Normal Editor pollution) caused by the contents and cables, the network outages and the general problem of energy generated by burning fossil fuel, we came to the conclusion that we should go for an autonomous solution. So we started to calculate the consumption of all the electric units needed for the plot. We calculated that we would need a photovoltaic system of 1.5-2 kW peak power and a small wind generator (100cm diameter) of 400 W. The combination of the two different power sources is ideal because of the varying strength of wind and solar radiation throughout the year. In summer the photovoltaic system has its maximum production rate while the wind speed is generally low, whereas in winter solar radiation decreases but wind speed increases, so that the lower power production of the photovoltaic system is supplemented by the wind generator. For times of very little power production we calculated a battery bank with 1600 Ah at 12 V which gives us 2 days of power. For periods of heavy power usage such as during construction work we have a 7 kW diesel generator that functions also as a backup in case of system failure. The overall cost including installation comes out at about 13,000 euro. Like most Islands in the Cyclades Tinos has an average annual rainfall of around 400mm which makes water a scarce local resource. Therefore we put a lot of effort into the design and planning of the water system. The goal was to design a system that can harvest and store enough rainwater to supply the needs for 6-8 people throughout the 4 completely dry summer months. We estimated our actual water usage in order to calculate the size of the surfaces we would need to collect the rainwater and the size of the cistern required to store the water throughout the summer. We calculated that we would need 240sqm of hard surface to collect around 100,000L of rainwater for 6-8 people and for irrigating the gardens. We started to calculate our potential water requirement by looking at the average daily water consumption of a single person in the European Union. With an average of 160L we came quite quickly to the conclusion that it will be very hard to find a way of satisfying such a demand. So we started to look at the numbers more closely. 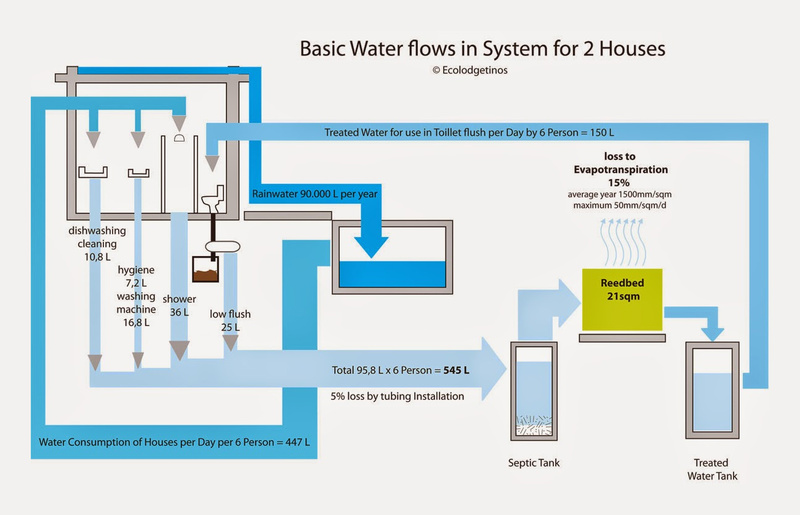 These showed clearly that the flush toilet represents one of the largest demands on the water supply. But we kept the composting option in mind. So we decided that an ultra low-flush toilet (2.5L//4L) was the way to go. Actually, it is not easy to source them on the market. For all the above reasons we went for a reed-bed filtration plant. The advantages of this system are that you can construct it using a DIY approach, it is very robust in coping with usage fluctuation, it requires very few electronic components and it can be designed to be a beautiful part of the garden. Furthermore the purification power is so high it is one of the few systems that allow you to reuse the treated water. At the beginning of the project we were dreaming about a completely passive house design. Due to a lack of experience, time and other considerations we had to give up this approach. But when we were dreaming about it we read and saw a lot. So we kept some basic guidelines in mind while designing the houses and landscaping the plot. As mentioned above our system of choice was the reed-bed filtration plant. There are mainly two kinds of systems that are widely used and well documented; the vertical and the horizontal flow system. We decided on the vertical flow because of higher filtration rates per square meter and a more robust overall design with less possibility of clogging in the sand filter. As a general size we calculated with 4-5sqm per inhabitant. This figure is defined in the standard literature on black water. 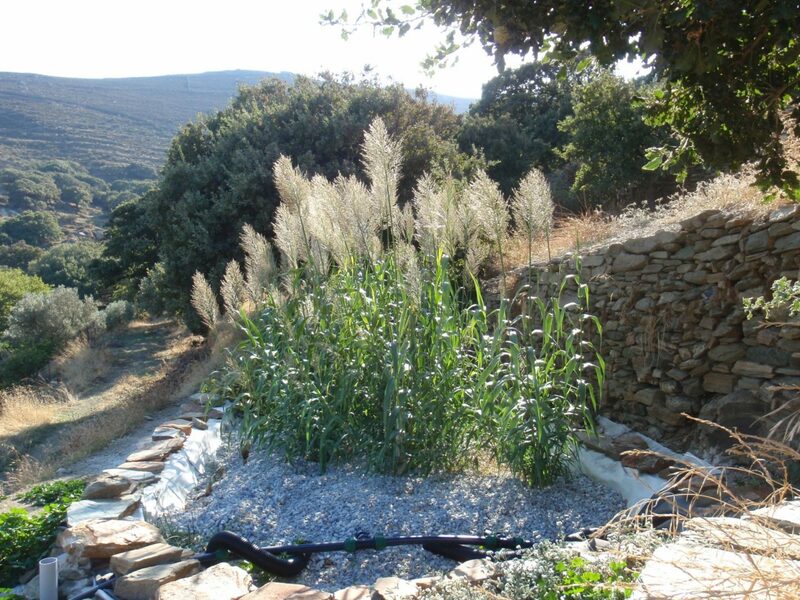 In order to provide enough treated water for the toilet flush we had to modify the existing design approaches because they do not take into consideration that in our climatic region most of the water intake will be evapotranspirated (consumed) by the reeds. To reduce this effect we had to reduce the size which also necessitated the reduction in the pollution of the black water. To achieve this reduction we came back to the composting solution. We designed a system that splits black water from grey water at the source. This reduces the pollution in the first stage. Then we incorporated a centralized composting mechanism into the black water stream. This means that all the solids such as manure and paper are filtered out of the stream before it reaches the reed bed system. By doing this the black water has pollutant levels that are close again to those of grey water. This approach leads to a size reduction of the reed bed by 40% and comes to a theoretic water output gain of 30%. There are many more customisation details in our design that still have to be evaluated in real life, so we will report back at a later stage. The centralized manure composting unit is a Swedish product called Aquatron. The solids need around 5 months to compost. This compost can be used for non-edible garden plants. If a 12-month hot composting process is added theoratically the content would be suitable for edible plants. 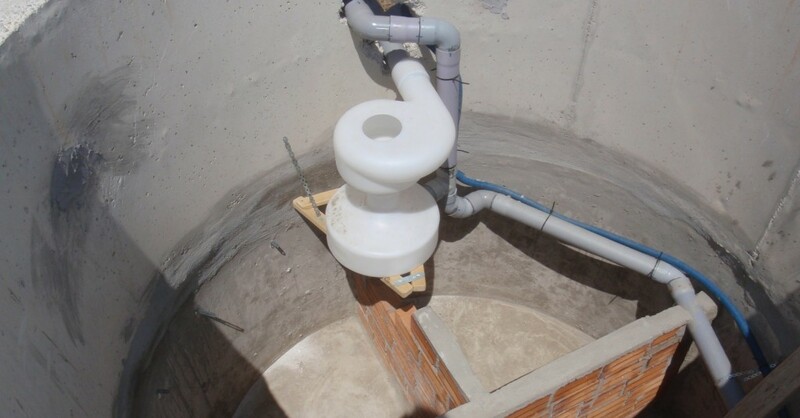 By taking out the solids from the sewage water stream the size of the sedimentation tanks is reduced. The sedimentation sludge that you have to get rid of every once in a while is also reduced to a minimum by this design.